Mother’s Day Thoughts – I’ll be Honest. I’m Frustrated. I was reading some articles about Mother’s day on a mummy/wifey blog and very many articles, and comments, revolve around the how much people hate it! I never realized so many people are so up-in-arms about Mother’s Day. I always thought perhaps it was hard for some people who didn’t have their mums with them anymore or who lived too far away to celebrate together. Turns out, people are flipping their lids because apparently celebrating motherhood is degrading to those who aren’t mothers. Who knew? Humanity. You’re killing me. Can you just realize for one moment that life isn’t about you??? And this “painful and terrible day that you refuse to be a part of” for a variety of reasons is just not justifiable? Let me first say that anyone who has ever lived thru a miscarriage or lost a child in any way is already stronger than me; that is one of my greatest fears in life. But, to me, you are a mother, your child just isn’t with you anymore. Don’t make a lost child (either in the world, or to the world) less than a real child. I just don’t understand why fellow women would insist that the hardest job on earth isn’t worth being celebrated because it’s “too painful” for you. And people who are in their late 20s-30s either single, or childless (have never carried or adopted a child) and just can’t handle sitting in a church service where the pastor asks the mums to stand up….and you “just can’t handle it anymore” and stand up?? what??! I don’t understand the pressure to do that…It literally makes zero sense to me. “Real women” don’t have children. “Real women” do have children! Why does that have to define us?? Why do we desire to remove the holiday alltogether because the memory of our children and the love and plan of God isn’t enough for us?? ….I guess that’s what it boils down to. I work a retail job 🙂 So does my boyfriend, and some of my best friends in New York 🙂 We work at the Christian-owned craft store chain, Hobby Lobby 🙂 We sell a variety of crafters things, like seasonal decorations, party supplies, scrapbooking/rubber stamps and paper, unfinished wood, clay, beads and jewelry making supplies, iron-ons, tie dye and t-shirts, paints, pastels, pencils and canvases and sketchbooks, we have our own custom framing shop, yarn, cotton thread, embroidery thread, sewing patterns and fabric, thread, synthetic flowers and flower arrangements (we do custom flower arrangements too) and two aisles of wedding supplies. 🙂 oh, and the whole middle of the store is home decor stuff like chalkboards and wall hangings, picture frames, candles and furniture. It’s a pretty amazing retail store 🙂 Plus we have tons of weekly sales and a coupon that takes 40% off any one item that isn’t already on sale. We’re pretty accommodating people. Today, because one of our normal cashiers is out with a back injury, i was on the register all day instead of processing my freight in the Home Accents section. (basically, putting away all the stuff we got in delivery two days ago). I was kinda disappointed i wasn’t gonna get my stuff done, but it was whatever. Everyone was absolutely wonderful. 🙂 Honestly. Our customers are absolutely great, and i’m so thankful for them, and how understanding and friendly they are! But, there’s always a statistic. And when you get such wonderful people all day, you’re bound to get at least one truly awful person. This middle-aged lady came up with four Thanksgiving decorations. Something about her attitude made me nervous; she just seemed very forceful and impatient. I was anxious to just get her out of the store, but she proceeded to start to pay by flinging change from her purse onto the counter. I patiently counted out $5.13 of her $36 in change, and keyed it in, because we have to do everything manually; no scanners at Hobby Lobby. Instead, i accidentally typed $50.13, because i always get my zeros messed up. It said i owed her a bunch of change and printed a receipt. Aww, crap. Of all the people. We both just sat frozen for a minute, and i wasn’t sure what to do. Pedro and i have a rocky relationship, but he showed his true colors today. He came over and i explained it to him. He said what he had to do was “return” the four things, approve the return, and then ring them back in again. By now, there were 4-5 other people behind this lady who is still griping her black heart out. Finally, i handed her the return receipt and said i needed her to sign it and she flung the pen at me and said “no YOU sign it! Its your mistake, doll, and i’m not putting up with this-” and she kept going on and on about i made this mistake and she shouldn’t have to do anything, even sign a receipt, to fix it. …And i just looked at her. I couldn’t believe a fully grown woman was giving me the same bullroar that my 8-year-old sister did when i lived at home. And she goes “UM, NO, I-” And he points out that all she needs to do is click okay on the PINpad. She snatches the receipt out of my hand and walks out the door. i just stared at Pedro. i couldn’t believe this had happened to me; that this fully grown woman made a complete and total idiot of herself in front of 4 other adults and at least one kid. I wasn’t going to cry. Absolutely not. Like, real, lip trembling, hand shaking, tears-crying. Every person who observed the whole thing was so nice to me and said i did just fine and complimented me on not completely losing it, and that only made me cry harder. There was also a sweet mom; she was so great…As a retail worker, you see lots and lots of parenting styles. Some are like my mom who kinda let their kids be adventurous and they can look and touch but know better than to ask for or break anything, and the threat of “okay, fine, see ya later!” was a common thing when we didn’t come when we were called. Some are more annoying then their kids, when they give the kids anything they want, at any cost, and those same people usually tend to have either horribly behaved kids, or normal kids with horribly behaved parents. I had one lady with a baby about 1 1/2 years old, and all she would do was yell “STOP IT! STOP IT! STOP! STOPPIT! !” For the entire 3 minutes of her transaction; way more annoying than her kid was. As the baby, of course, walked right past the basket holder and the mom sweetly redirected her, and showed her where it went…I couldn’t even deal; i just kept smiling! But seriously. This is the life of a retail worker 🙂 it’s work, its tiring. Its busy, it takes alot of energy. There’s strained relationships and best friends. There’s good people and there’s losers. You never know what has happened to the cashier 15 or 10 minutes ago, so please, make it your goal to be their favorite customer that day, no matter what happens. Especially if they make a mistake. 1. This is not a blog post about how guys should text/call their girlfriends more often. 2. This is not a post about how to survive long distance relationships, tho i did that as well. Today i had a good conversation with dear Marth today. It started out with me being frustrated because something that was important to me didn’t seem to be important to him at all. He wasn’t there for something that was important to me on a consistent basis. i always would ask why, after the fact, in as gentle and understanding a tone as i could possibly manage, and he would always have a good explanation. But today tore it. I just didn’t understand what was going on with him, it was making me doubt his character and no amount of “good explanations” was going to save him from a woman scorned. I went back to his house, and he could see the “flames…on the side of my face…” as i was so lividly furious at him. And, of course, because i’m getting old and hormonal, i can’t get mad without crying anymore, so after his best friend Caleb left, I spoke irritatedly…then loudly…then walked into the kitchen and started crying. After a little bit, he walked in too, and rubbed my shoulder. I felt awful for yelling at him, and even more awful because i still didn’t know what to do and yelling didn’t seem to have gotten me anywhere. He hugged me, and after a moment, i realized he was crying too, and he explained to me a situation that i was completely unaware of, and made all my anger dissipate. That was honestly really reassuring, because i trust him. And he’s proven himself to always have good reasons in the past. It doesn’t mean that he’s excused from anything important to me, but i am now 100% positive that when he is unable to be there, it’s not because he’s just blowing me off. Sometimes in order to find out the reason for an ongoing issue in a person , you have to take time, and probe deeper than you think. 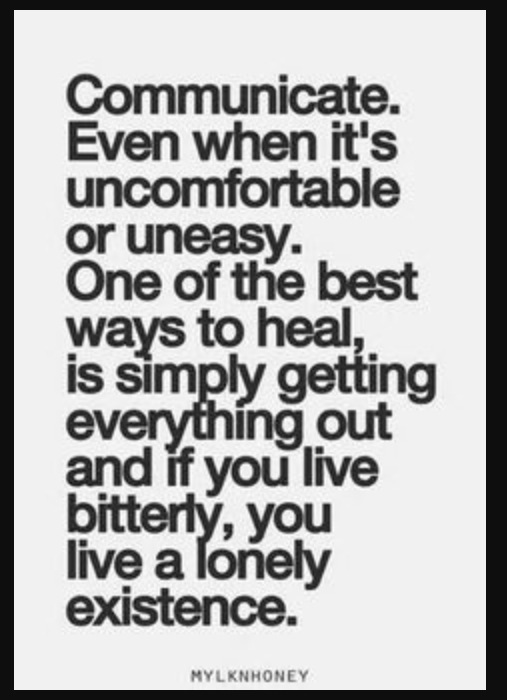 Especially if it’s someone you’re close to, eventually the answer will come out. Even tho crying and yelling usually can produce immediate results in a gentler soul, it’s not usually the best way to handle it, because it leaves a hurting person feeling more hurt and hopeless because now they’re angering the person who matters most to them. Be understanding. When someone opens up to you about an ongoing issue, even tho something seems like an easy fix to you, if it was an easy fix, they would have done it already. Be open and understanding to why they’re putting themselves thru this issue, and be willing to fight alongside them, not treat them like they’re stupid. Opening up about ongoing issues is especially difficult for introverts. They’d rather keep it between themselves and one or two good friends of the same gender than open up to even their girlfriend. Part of it’s pride, and part of it is they’re used to handling things on their own.